All those numbers… one after another… something bad is bound to happen, right? If you’re ever scared or ashamed of making ecommerce accounting mistakes, the first thing you should know is that you’re not alone. Accounting errors occur from time to time, whether you’re an SMB that handles your own accounts or a global enterprise with a room of professional accountants. The good news is that, by keeping an eye out for the common mistakes, you can effectively avoid them. With that in mind, we’ve compiled a list of the 6 ecommerce accounting mistakes that happen most often. Be on the lookout for these usual suspects next time you’re balancing your books. The source of many ecommerce accounting errors can be traced back to how records are kept. Specifically, the chart of accounts is either incomplete, incorrect, or just an organizational mess. A chart of accounts is a business tool meant to keep your financial records crystal clear, but you get what you put into it. If you neglect your chart of accounts or don’t take it seriously, if won’t be much help; but if you take a proactive approach and adopt a system that serves your company’s individual accounting needs, you’ll be surprised how much time it saves (and how many errors you avoid). For more guidance, read our best practices for an ecommerce chart of accounts. To be clear, profits are not necessarily income. At least not right away. Payments can be delayed or cancelled, so it’s best not to count your chickens before they’ve hatched. It’s tempting to record each sale you make as income, in part because success just feels good. Use a conservative estimate so you don’t spend more than you have, and don’t forget to account for payment fulfillment schedules and ongoing debt payments. Being too optimistic about cash inflows is an understandable mistake, but a mistake, nonetheless. If you lose count of your inventory, you lose count of your cost of goods sold (COGS). Data accuracy is a tentpole for good business decisions, so be meticulous about inventory management. A lot can go wrong, though. Stock levels or the products themselves, could be listed incorrectly, data from different products could get mixed up, or problems with your internal methods of organization could lead to the wrong items getting pulled and shipped. 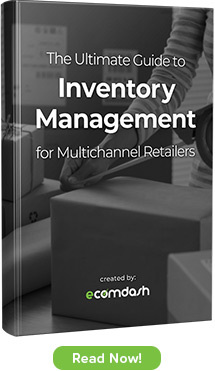 While these problems could possibly be solved by keeping a closer eye on your warehouses, a lot of online retailers are opting instead for better ecommerce inventory software. With Ecomdash and other such tools, the software keeps an accurate and reliable record of your inventory, updated in real time, so that’s one less accounting issue you need to worry about. No one likes menial tasks like double-checking data, which likely explains why this error landed on our list. The fact is, sometimes details do slip through the cracks, and double-checking the accuracy of your accounting data is the best precaution against missing anything. Did you receive payment for everything recorded? Are the amounts correct? Do your different reports all line up? Double check the numbers and sniff out the origin of any discrepancies. Also, don’t be fooled into thinking that using computerized software is fool-proof. The computer program itself might be flawless, but the information humans enter into it is not. On top of double checking that the data in your books match, you also want to periodically double check that your bank accounts match your books. Reconciling your accounts adds another safeguard against miscalculations and helps you catch costly mistakes before it’s too late. The ideal frequency to reconcile your bank accounts is every month. This helps you account for every transaction, so you don’t lose any money, plus it gives you more stable business data for better predictions moving forward. “Sales tax” is a broad category — what about it leads to accounting mistakes? Do we mean you should pay attention to which products are taxable and where? Yes. Do we mean making sure you’re registered properly and in the right states? Yes. Do we mean providing valid resale certificates? Yes. What we’re trying to say is, sales tax has a high propensity for error. Murphy’s law is strong — what can go wrong, will go wrong. To make matters doubly complex, the case of South Dakota v. Wayfair, Inc., et al. now opens up ecommerce stores all over the world to pay individual state sales taxes on top of other taxes. Sales tax can have disruptive consequences, so make sure you have everything squared away in every state relevant to you — and make sure you know which states are actually relevant to you! If you’re looking for some help with the basics, read our previous article Understanding Taxes for Ecommerce Sellers. Proper accounting can be hard work, but at least that effort pays off. Having trustworthy records and keeping on the ball with your finances does nothing but improve your business: you can plan your budgets more thoroughly, create more realistic timetables, and catch mistakes before they’re too late. Extra time spent cleaning up problematic books is hardly time wasted.